Malaysian National Annex to Eurocode 8 was released in the beginning of 2017 and now buildings in Malaysia are required to be designed for seismic actions. One main concern in Malaysia regarding the design for seismic forces is the increase in the quantity of reinforcement bars specially when compared with the conventional design (i.e. designing only for gravity loads). 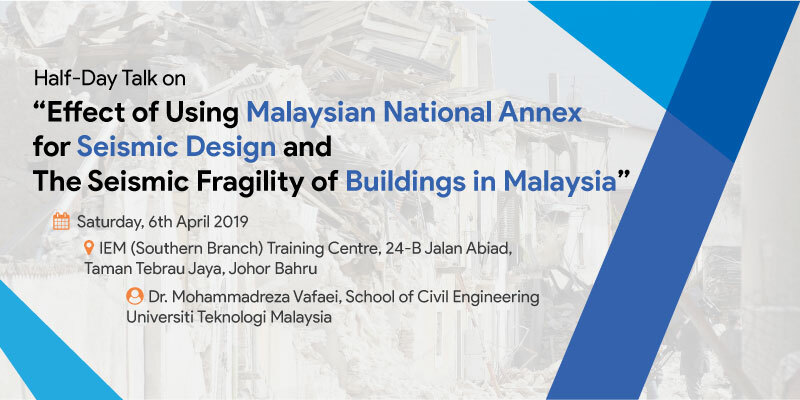 In this talk, at first, a short introduction will be given to the fundamentals of seismic design and then a critical review will be conducted on the Malaysian national annex for seismic design. Next, the results of a series of comparative studies that show the percentage increase in the quantity of reinforcement bars when designing buildings based on Malaysian national annex for seismic forces will be presented. In the second part of this talk, seismic vulnerability of existing buildings in Malaysia will be discussed through the framework of fragility curves. Finally, the available solutions for the seismic retrofit of vulnerable structures will be explained. Dr. Mohammadreza Vafaei is currently a Senior Lecturer in the Faculty of Engineering, School of Civil Engineering, Universiti Teknologi Malaysia (UTM). He received his Bachelor and Master’s degree from Iran in 2000 and 2004 and obtained his PhD from Universiti Teknologi Malaysia in 2013. Soon after his graduation he was awarded a post-doctoral fellowship from Universiti Teknologi Malaysia. Dr. Vafaei is an active member of American Society of Civil Engineering (ASCE) and Earthquake Engineering Research Institute (EERI, USA). As a professional engineer that has served several consultant companies, he has led seismic design of many structures including tall residential and office buildings, airport terminals, air traffic control towers, lattice telecommunication towers, bridges, water reservoirs and monumental structures. During past years, Dr. Vafaei has served as the scientific committee of many international conferences and has been the member of editorial boards of scientific journals like The Open Civil Engineering Journal. He has been also selected as the keynote speaker for three international conferences and has been invited as the speaker for many national seminars and workshops. Dr. Vafaei has more than 45 publications in the referred journals and conferences.